To generate the illustration, try mapping the current process or analysing who is involved and when. Make sure that all areas of the business are represented. Having a simple, graphical overview of the product development process helps to ensure that all personnel either involved in or influenced by new product development understand their role. 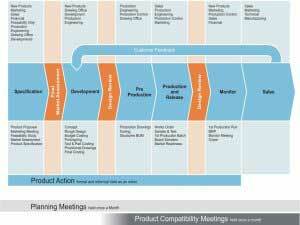 A good test is to ask people whether or not they can name the major phases of product development. An effective illustration can be printed on cards and distributed throughout the company - no-one should have an excuse for not understanding the process.